IT'S made up of more than 4,000,000 parts from 1,500 companies around the world, takes nine months to build at a cost of US$390m, seventy-seven have already been sold, deposits put down on 180 more, and one customer wants ninety – worth US$35.1-billion at list price…. We're talking about the Airbus A380, the biggest civil aircraft in aviation history whose statistics and everything else about it are simply mind-blowing. Yet even more gee-whiz and golly-gosh is just how those 4-million parts from thirty countries find their way to Airbus's A380 assembly plant at Toulouse in south-western France. 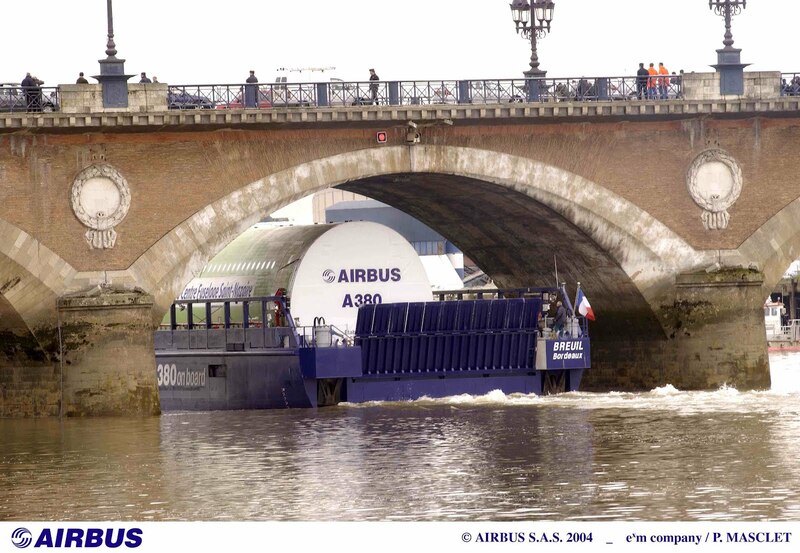 Because while most can be trucked, railed, river-barged or flown-in from Europe, the UK and others places around the globe – including 800 factories in the USA alone – getting sections of the super-size fuselage, wings and tailplanes to Toulouse is an exercise of virtually military logistics. And it's meant spending millions of dollars on construction of a special ocean-going freighter, several river barges and a half-dozen low-loaders because nothing else was capable of carrying these sections, plus research by teams of scientists into river currents, flows and depths, weekly police closures of major roads – even regular removal and replacement of massive overhead road signs to allow over-height parts to trundle across the French countryside in dead of night. 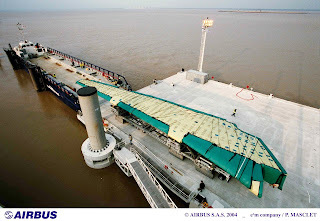 The unique Ville de Bordeaux freighter was built with a 120 X 20-metre span-free cargo hold, and every week collects an A380's voluminous forward and aft fuselage sections from where they're built in Hamburg, and heads to Saint-Nazaire on France's Bay of Biscay where the centre fuselage section built there is also loaded aboard. 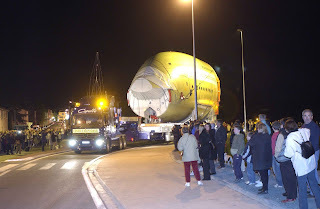 Then it's off to Cadiz in Spain for the horizontal tailplane, and across the English Channel to Mostyn in Wales for the A380's two vast 45-metre long, 7-metre wide wings that are constructed at Broughton in North Wales. And getting each of those 38-tonne wings down to Mostyn is a lesson in dexterity in itself, taking a whole week on one of those special barges to travel just 35-kilometres at a snail's pace 5kmh – juggling tidal cycles so as to be in exactly the right position at exactly the right time to clear historic stone bridges by just millimetres and river bottoms by equally few millimetres, clearances reckoned-on by those teams of scientists who even calculated the affects of just one hour's rainfall on the depth of the River Dee. Finally the Ville de Bordeaux re-crosses the Channel to Pauillac on France's River Garonne, where its bizarre-looking stockpile is loaded onto custom-built 75-metre long barges that will carry it 95-kilometres up-river to a road transfer station at Langon. And from there it's a 240-kilometre road trip, that although undertaken week-in, week-out, never fails to draw crowds to gawk at the six amazing 96-wheel low-loaders used to move the vast sections on the final part of their journey. 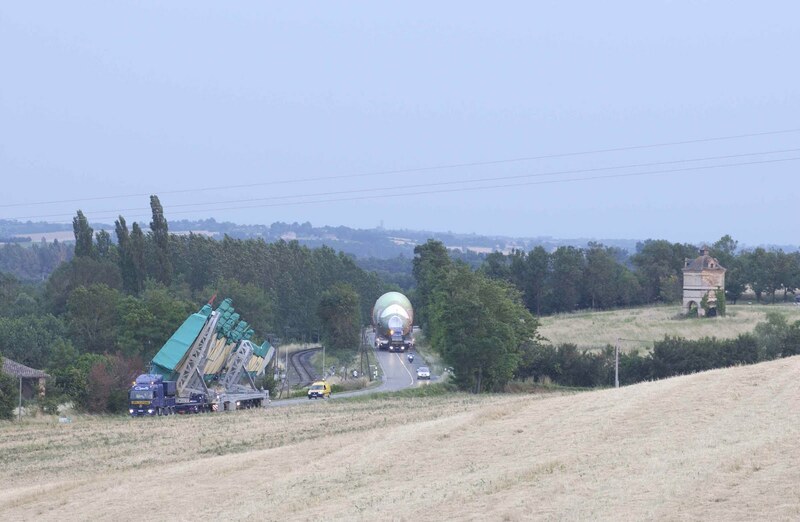 Each of these low-loaders is hauled by a throaty 600hp prime-mover, departing Langon at precisely 10pm on the same night each week – complete with police escorts and an Airbus support team of sixty to deal with any breakdowns along the way, assist divert traffic onto other roadways, and to remove and then replace huge overhead road signs as the convoy rolls by. Overhead power and phone lines along the 240km route were even permanently removed and buried underground to assist, roads widened where necessary to a minimum 13-metres, bridges strengthened and roadside trees removed. 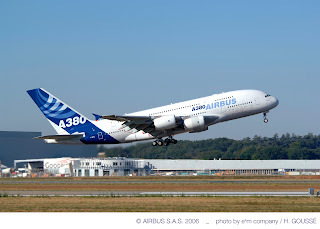 Then finally once at Toulouse the assembly of the next A380 begins, each one taking nine months to complete and the plant putting out three completed aircraft a month. 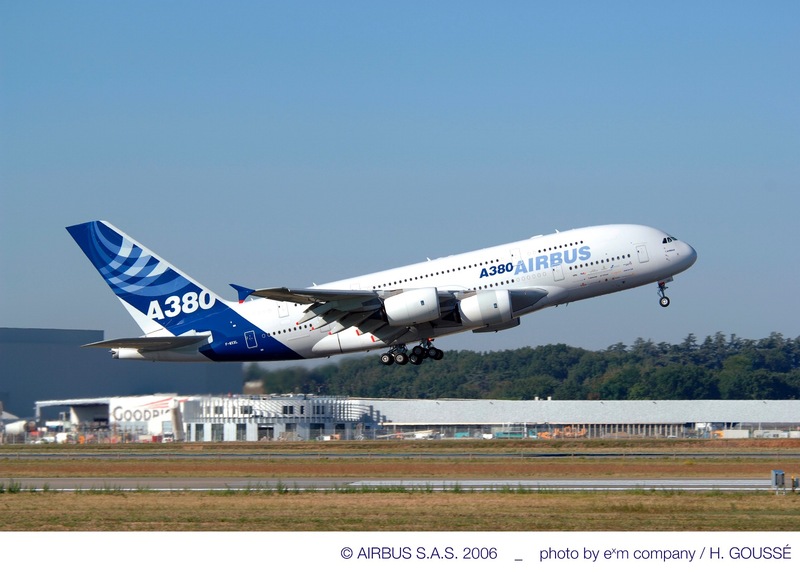 The A380 can carry 525 passengers in three classes, but one airline wants two with 853 Economy seats each. There are plans for a "stretch" version with 960 all-Economy seats. An A380 weighs up to 560 tonnes at take-off (82 times more than Charles Kingsford-Smith's Southern Cross,) including enough fuel to fill 21 road tankers and fly it non-stop Sydney-Istanbul. 10,000 bolts hold the three fuselage sections together, 8000 the wings to the fuselage and there's 500km of electrical wiring in each aircraft. There's enough room on the two passenger decks to put nearly three tennis courts. UNLOADING centre fuselage section at Pauillic in France. 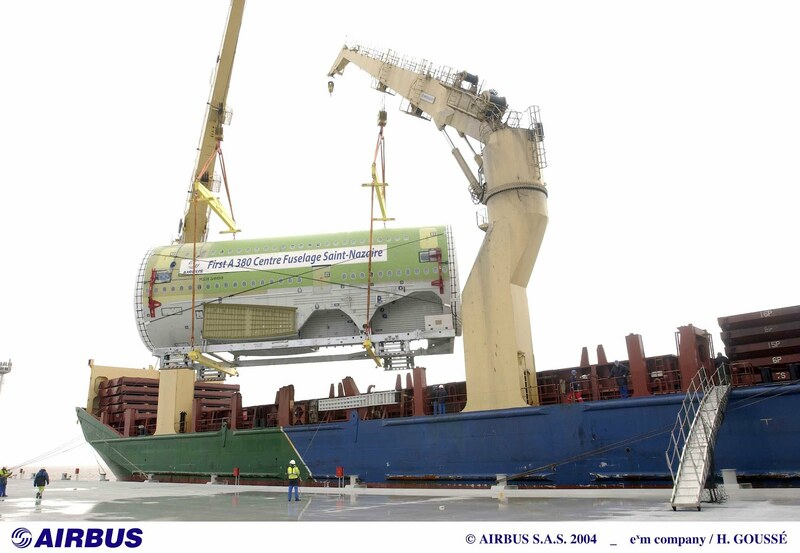 SPECIAL BARGES were built to carry the massive wings. 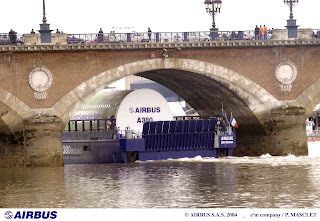 TIGHT fit: barge with fuselage sections squeezes under a bridge. EVERY week crowds gather to gawk at the 96-wheel low-loaders and their huge cargoes. NOW that's an over-size load. FINALLY finished – nine months later and another A380 is up and flying.